Hey guys! sorry for the late late monthly news update! 1. The start of the yearly Summer Wars! Browse the site to collect balloons of your team color and launch them at your friends from their profile pages. The more balloons you get, the more points you get. Summer wars points can be exchanged for clip-ons, shelf decorations, and tasty treats for your dinos on the Summer Splash page! 2. Our monthly item for July is the Mystery Egg! Use this fancy item to change one lab dino into a fierce Allosaurus! As with other changing items, you get to choose which marking the allo will end up with. This month's update has been written by our dear mod Zani, since I've sort of been panicking about traveling to Europe (tomorrow). I hope everyone is doing okay! Sorry for the slowness on the news updates. This month’s donation item is Sack of HerbiFertile. This item makes a herd of herbivores breed so you don’t need to wait for the next breeding season. Speaking of June, were you aware it’s aquarium, dairy, and candy month? I don’t suggest celebrating all of those at the same time. It would probably be sticky and terrible. June 16th is also Eat Your Vegetables day, which is good because it’s apparently National Fresh Fruits and Vegetables month too. So be sure to eat your vegetables! This news post has been sponsored by June Represents Too Many Things Association." Also, Grox asked me to warn everyone that it is now lawnmower season, so I hope everyone's doing alright, despite the lawnmowers, candy, and junebugs this month! Also, I believe later in this month is national Go-Out-And-Skateboard day, which seems like a good thing to celebrate. I'll look up the actual date when I figure out the item for the month! Hello again EX and welcome to another late Monthly Announcement! You guys can celebrate by getting the Glowing Yellow Rose this month! Because I'm told that April showers bring May Acrocanthosauruses! Also, May 23 is World Turtle Day, so go out there and hug a reptile! Today is our dear mod Clara's birthday! She's a sweetheart, so everyone celebrate by playing any nearby bagpipes you might happen across, and singing along to Kryptonite loudly in public if it comes up on the radio! Also, her adorable Tartan Stego plushes are in stock today! Either way, hope you have a great day, Clara c:! New day and new month! 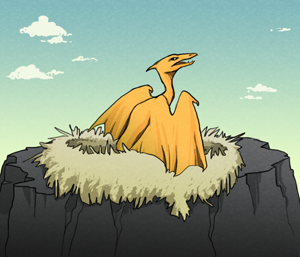 There have been rumors the lab had a break in regarding a very greedy pterodactyl. She’s been known for being maternal, even when it comes to the lowest of the species on Exhibited. I wonder why kind of eggs she’s taken under her wing today. I wonder who’s brave enough to invade the nest to see, let alone take on that kind of responsibility for whatever’s there. Sorry about the delay there, guys! This month we've got the Bag of Health Goodies! Sorry about the slight delay in posting the results for the V-Day event, but the results are in! Good competition from all our players, here are the top three and our runners up! 1st) Murmeltier (#29555)! -- Murmeltier gets a sack of Herbifertile, Chocolate oysters, 30 scales and a Terror Egg! 2nd) Brother Woodchuck (#21071)! -- Woodchuck gets a sack of Herbifertile, a Terror Egg, and 10 scales! And our two runners up are Wetha (#29175) and Riley (#20194) -- Both of them get some Chocolate Oysters! Finally! 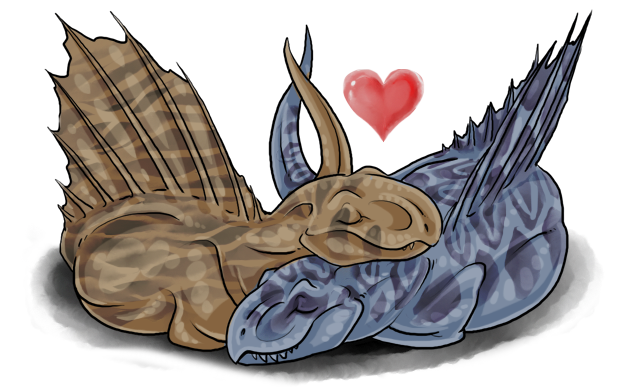 Anyone who bred 50+ eggs will get a scale for participating, and EVERYONE who participated at all gets a Valentines Cookie! In celebration of today, we've still got the Valentines Event going on. Also, the V-Day Plushies are in stock in the plushy store, so go grab some for your shelf!